I like this sort of book, the type that combines complex ideas with approachable expression and style. It is even more enjoyable when I’m already interested in the topic. 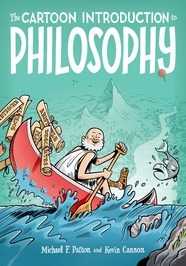 The Cartoon Introduction to Philosophy provides a solid, basic foundation to the thoughtful contemplation and interesting ideas in philosophy. It is scheduled to be published in April 2015. The book presents its information using an enjoyable graphic style that is well done and pleasant to the eyes. The topics are broken into six chapters, each of which builds on the previous. The order is logical, which is good for a book on philosophy, and is actually where we start after a short introduction. Logic is followed by a discussion of perception. This leads to a discussion of the mind, free will, God, and ethics. The cartoon narrative that is the vehicle for these discussions uses a guide, Heraclitus, one of the early philosophers who predated Socrates. He takes the reader on a journey from the beginning to learn about philosophical thought from the earliest stage to later ideas that built upon, and often contradicted, them. Most of the big names are mentioned along with a brief description of their main themes. This includes all your favorites across time, such as Plato, Descartes, and Mill. In total, I counted more than 20 different philosophers introduced. That is great in a comic-style book of 168 pages. The introductions are short and necessarily simplified, but this provides an excellent beginning to help the reader get the big picture. I recommend the book for anyone from later elementary school through college who does not already have a basic understanding of philosophy and the main schools of thought. Disclosure: I was given my copy of this book by the publisher as a review copy. See also: Are All Book Reviews Positive? This entry was posted in Book/Magazine Reviews, General, Manga/Comics, Ubuntu Planet. Bookmark the permalink.